This whole weekend has reeked of ground hog day. I've been working on WIPS. The same ones I've been working on since about 1983. But by this afternoon , I was feeling like this. Because I can move mountains of unfinished projects when I put my mind to it. I knocked off the last 20 Hourglass Blocks. I was doing the happy dance and fist pumping the air. 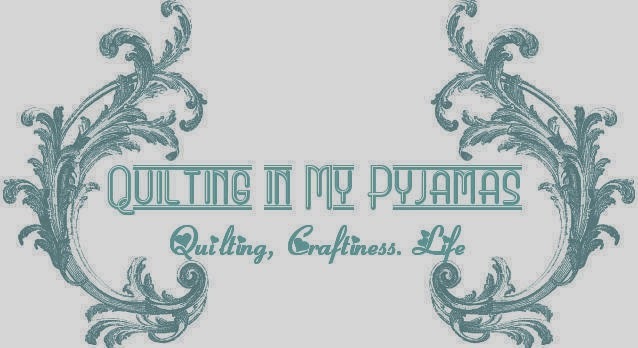 I'm going to be so glad when this quilt is done because I cant wait to see how it looks! And here's the finished pile. All 64 of them. And laid them out so I can sew the top this week ...Scrappy and bright really makes me happy. I LOVE the way this quilt looks. My flower garden hexagons got a workout after being neglected for about two months. 3 more done and another almost finished. I still have 36 to go....Fortunately, I'm not in a hurry. Chocolate tarts rose like a phoenix from the ashes. This was meant to be chocolate fudge but I screwed it up so badly at the heating condensed milk stage that I had to improvise so as not to waste 400 grams (that's almost a pound ) of very nice dark chocolate. The tarts taste divine and it just wouldn't be right if I didn't manage to mess it up somehow. Just one question? Why does my pastry always end up looking like it has leprosy? So I'm a happy camper ...I can finally see some progress and light at the end of the tunnel with projects that have been lurking forever , and I'm enjoying sucking the chocolate filling out of those tart cases. I'd call that a successful weekend. I am exhausted just READING all that you accomplished! Yes! No wonder you did the Rocky dance. Looks like a great weekend. I'm pretty happy with my weekend too. I didn't do enough to pump the air like Rocky, but there was definitely some quiet plodding. The chocolate tarts look yummy! Great SAVE there. Your rainbow blocks make me smile, too. I love them. I love scrapy rainbow quilts. Hope you are still dancing - might help work off the calories! Really love the rainbow scrappy quilt! Holy crap! That is sooo much! Can't wait to see the hourglass finish, but all your quilt projects look lovely! You go girl! 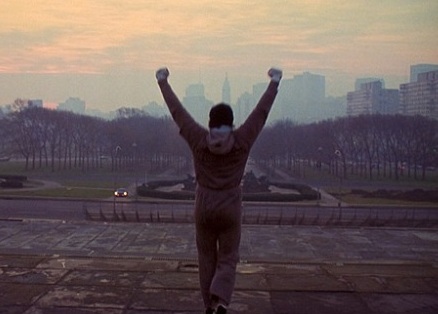 Rocky theme music is definitely warranted here, you sewed like a champion! All of your projects look fantastic! Hooray for finishing up WIPs! I hope to get a little time in over the next couple weeks to do the same. And I totally hear you a out being careful but having blocks finish up at a variet of sizes....what gives? This is why I think I shall never be in a bee, I am sure mine would be the mutant block of the set. My granny square blocks are all shapes and sizes, will have to do some creative finessing there to not lose all my points in the seam, grrrrr! Save me one of those yummy tarts, will you? Wow! Lots of really beautiful projects! I love that scrappy rainbow log cabin! And I can't wait to see your hourglass quilt either! What fabric line are you using for your hexie flowers? Those are really pretty! There might be hexies in my future! Apparently, you've kicked the Ides of March squarely in the fanny. Good for you! Now, if I could only do the same! Congrats on a very successful weekend. Impressive crossing-off-the-to-do-list crafting. Proud of you! I have no explanation for baking since I don't do it! So you got your mojo back then! So much going on, I don't know where to start - all lovely. Anything that ends with sucking chocolate has got to be good. You've got your quilty mojo back... that calls for celebrations! You made up for any non-productive time in one day. That is amazing. The hourglass quilt will be beautiful. I can't wait to see it and how you finish it off. I admire the patience/diligence with the hexies .. oh, and your rainbow quilt is just amazingly beautiful. and on top of that cooking .. I think I can hear the Rocky theme from here ..
when your mojo returns it surely makes you work hard! Love everything here - those red and white FW blocks look amazing, and your hourglasses are perfect, they will make a very pretty quilt. Bright and scrappy is looking gorgeous all laid out there waiting for the next sewing session. Yum chocolate tarts - you would have needed those to keep up your energy while sewing up a storm. Holy Guacamole Batman, that fire under your a**e really got you going. You certainly did move mountains. Very very impressed. Those FW blocks are looking fabulous. I'm thinking you could do a regular post on your baking attempts. Kind of like Slack Tea Thursday, which by the way, I still miss. Unlike your awesome cooking skills, your baking always produces something to talk about. A very successful weekend Shay! OMG!! Woman You are a Power Machine...Love the look of your Hourglass and well done on the Tarts...Delish! Wow, you have been busy! The chocolate tarts look very nice, any chance of the recipe? That's it...I'm getting you a Super Woman t-shirt. End of story. Gosh I don't know what I have been doing....I think it must those chokkie tarts you have been imbibing. Beautiful progress made on everything. wow - and you slept when??? looking very good at chez pj's...love your fw, the hourglass blocks (can't wait to see that finished too! )....just about everything - go you!! your WIPs are all beautiful -- congratulations for making progress on so many !!! mine are more like WOH ... works on hiatus. You sure can move mountains! Look at you go! Chocolate tarts must be the secret fuel. Lovely things, all of them. Shay, are you still having Fav. Fridays?? Wow! The mojo came back in a big way!